GameSpite Quarterly 8 | Beyond the Beyond: Beyond Redemption? This might come as a bit of a surprise to some, not least to myself, but Camelot�s Beyond the Beyond is not a bad game! Camelot�s first classical RPG, which is largely reviled today by most veterans of the early PlayStation era, wasn't a great game by any means, but it's certainly not as bad as it's remembered today. Apart from its inherent faults and problems, there was one major factor that worked against Beyond the Beyond: High-wrought expectation. After all, the PlayStation was new, fresh, and brought new life and aspects to classical genres like racing games or fighters. Just imagine what it might do with an RPG! Sure, there was King's Field and there was Persona, but dammit, we were all waiting for a real Japanese-style role-playing-game: One with swords and magic and dragons, with anime characters, colorful hair, turn-based battles, and all these things. And when it became clearer and clearer that we weren't getting Arc the Lad any time soon, the collective hope shifted to Beyond the Beyond. After seeing pictures on the Internet (if you could afford it, back then) or in imported issues of Famitsu, we were certain that this would be the one to hold out for: Thanks to its polygonal world map and battle arenas, Beyond the Beyond should actually be able to make it past Sony�s alleged no-2D policy. 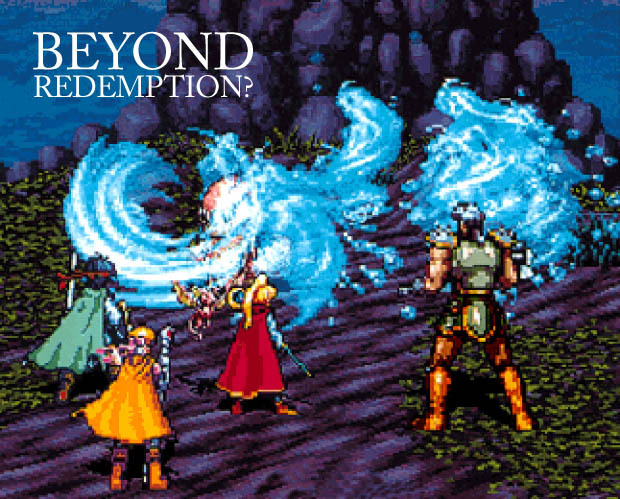 And after all, Beyond the Beyond was made by the guys behind Shining Force. 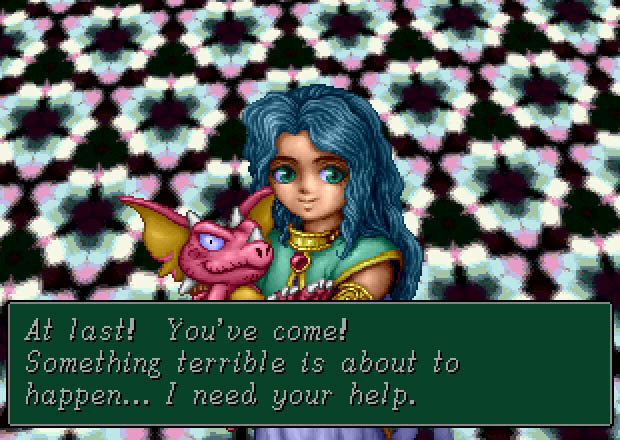 One look at the graphical style, the italicized font, and the characteristic menus made that quite clear. So yes, it's safe to say that expectations were exceedingly high. When the game finally arrived, we were ecstatic -- a beautiful double case adorned with the original Japanese art; back in the day, this was almost unheard of, with hideously redrawn covers like Breath of Fire? and its sequel or Lufia and the Fortress of Doom being the norm. It was this collective high that kept starved RPG fans going through the first couple of hours. But at some point, most players realized: �Somehow... it's not that good, is it?� After all, beautiful memories of RPG masterpieces like Final Fantasy III and Chrono Trigger were still fresh on players� mind. And in comparison to these, Beyond the Beyond was just... lacking. The story was so-so, characters like hero Finn or staff-chick Annie weren't too interesting, the game looked a bit too simple, the dialogue was vacuous, and the battle system too stiff, not to speak of the exorbitant random-encounter rate. It's probably safe to say, that most people never finished Beyond the Beyond: The extreme length of the game was probably just the final nail in the coffin. But going back to Beyond the Beyond today, you might discover it's actually not as bad as remembered. 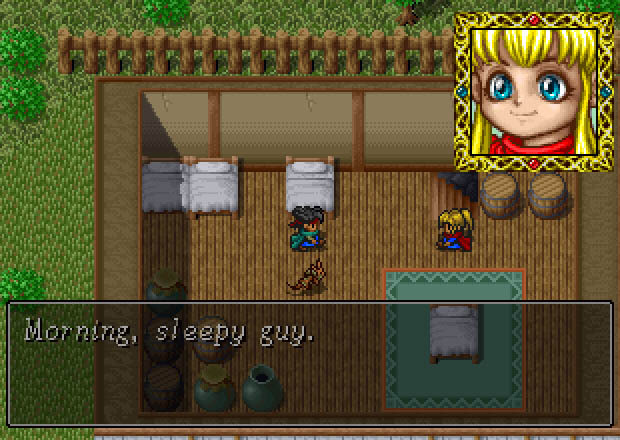 Yes, it's a fairly generic RPG with a couple of bad design decisions: Whoever decided it would be good idea to let the small sprite characters emote by a weird cringing motion before every second irrelevant textbox should have been stopped by force; the idea to curse an important character for many, many hours (thus rendering him almost completely useless) wasn't brillant either; and the combination of too-frequent random battles and rather hard puzzle dungeons has always been problematic. But look beyond these niggling faults and the rather frugal presentation, and you find a rather servicable RPG that even brought a new idea to the table. Labeled the APS, Active Playing System, Beyond the Beyond incorporated timing elements into the turn-based battles: By pressing the X button while attacking or being attacked, one could increase the chance of performing double attacks or succesful parries. In the end, though, this mostly lead to simple button-mashing and made the battles even more of a chore�Square�s Final Fantasy VIII would incorporate a similar but better thought-out system a couple of years down the road. Playing Beyond the Beyond today is actually a rather interesting experience: Without the overblown expectations and with a bit of knowledge of what came afterwards, Beyond the Beyond is much more bearable. The chatty dialogue and the battle system bring the (for some reason incredibly popular) Golden Sun series to mind, and the music is pure Motoi Sakuraba -- in fact, it probably marks the first time many western RPG fans came into contact with Sakuraba�s typical style. Back then, of course, we couldn't know all that. All we saw was an RPG that felt old-fashioned, drawn-out, and in every way inferior to the 16-bit big-hitters. The game was panned by the critics and soon put aside by even the most motivated players -- due to the long dungeons and difficult bosses, playtime could easily reach triple digits. 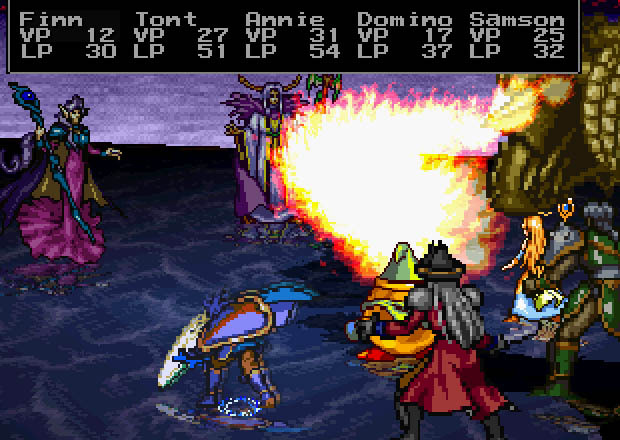 And after all, a few months later, RPG fans were appeased with Konami�s Suikoden, a game with a much brisker pace, a dramatically better story, and an excellent battle system. All these factors lead to Beyond the Beyond�s not entirely deserved infamy. Give it a try today (assuming it's still in your library) and you might be surprised. Just don't stick around for too long... and don't expect to finish it.